Signing off and toasting: To customizing done for you content like a pro in just a few minutes, and use it to really build your biz. Originally published May 2017; updated with even more awesomeness August 2018. Are you hesitant to use “done for you” (DFY) content because untold numbers of your colleagues and competitors use the exact same thing? Yes, DFY content can totally save you a ton of time and effort! Why reinvent the wheel and create something from scratch if you can buy it already done? There is a way to get the best of both worlds – using DFY content and not sounding like your colleagues and competitors. This is why I consider DFY content to be 80% done, not 100%. That last 20% is… making it unique to you! It doesn’t feel like it’s regurgitated or “cookie cutter”. Your readers know it IS you speaking in your authentic voice. It fits into your content strategy. It doesn’t take too much time (saving time is the name of the game when it comes to DFY content!). 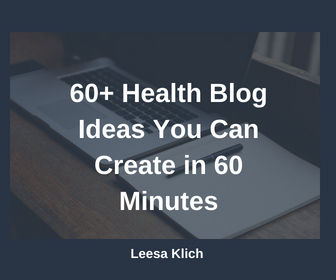 Done for you health content is a HUGE time (and money) saver for you! These tips will show you how to find quality DFY content, customize it for your audience, and turn it into content that markets your business – content marketing! I have two “pro tips” to consider before you buy any DFY products or programs. This really is the foundation for customization – you want the content to be super high-quality and need as little customization as possible, amiright? It is customizable in the first place. It won’t be everywhere with unlimited distribution throughout the whole industry at the same time. It will be high quality without a bunch of spelling, grammar, and punctuation errors. The information won’t be outdated. The author actually read the studies and interpreted them correctly – especially for health content. I highly recommend checking these out and making an informed decision before buying any “done for you” products or programs. ASIDE: I’ve addressed all of these concerns with my “done for you” health articles. Mine are fully customizable, discontinued after 50 sales, edited, purchasable one-at-a-time at any time, and packed with recent research studies as credible references. None of the customization strategies work if the blog post you purchase is irrelevant to your niche, audience, or brand. The topic and references have to jive with your area of expertise as much as possible or you’re better off researching and writing a brand-spankin’ new post from scratch! For example, if you recommend against caffeine and don’t do sports nutrition or personal training, then there’s not much you can do with the Caffeine and Sports Training post to make it relevant for you. If your focus is on digestive health, then an article on Atrial Fibrillation may not be that helpful for your audience either. And, if you’re against any type of dieting, a post on Intermittent Fasting may not support your message. So, make sure that you start with a quality niche-specific product that works for your brand and audience! If you purchase the right to use DFY content as is, then you certainly can copy and paste it as is. It should be quality and niche enough for you to do this. You can consider it to be 100% done and hit “publish” without any further time investment if you want to. I highly recommend spending a bit of time on each piece before you use it. Go through these eight ways to customize and make it your own. Whether you have five or sixty minutes, I’ve listed these in priority order – so, if you have a time limit, set your timer. Then go down the list and implement them one at a time. Stop when you run out of time or you’re done. 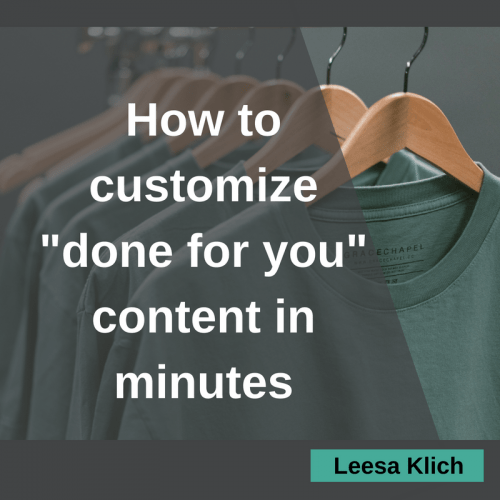 If you have zero minutes to customize a done for you product, at least do this! Use your own words or reuse the headline format of your most popular post. The Ultimate Guide to Writing Irresistible Subheads. PRO TIP: Just as you wouldn’t use a random blog post as your own, do NOT use a random image you find online either. Make sure it’s from a reputable company that is offering it for free or purchase rights to use it (pay the fee in advance, rather than the penalty later). BONUS POINTS: If you want an image that people will remember, run it through LaMem to find out how memorable it is. Once you have a great image, customize it with your brand colours, website and/or logo. Also, you might want to put your snazzy new headline smack in the middle of it so it shows clearly in social media thumbnails. I personally use Canva, here’s how (but don’t take my serious lack of graphic design skills as a hit against them. I’ve seen people make AMAZINGLY beautiful images from this free tool). Technically you buy content; but you actually need content marketing. You need the content to work for you and market your business and expertise. Creating and distributing relevant and valuable content to attract, acquire, and engage a clearly defined and understood target audience — with the objective of driving profitable customer action. The “marketing” part of the content marketing is specifically for driving action. So, after your headline and images are done, calls to action are uber-important! What do you want your readers to do (during or) after they read your article? By adding in social sharing buttons, email opt-in incentives, and links to your products and programs and other valuable content, you are making sure it’s building your email list and business. Hence “marketing”. Want help customizing “done for you” health content? I can help you take professionally-created “done for you” health content and customize it to be in your voice, and speak to your audience. Sign up here for the waitlist to my future mini-course. Make the opening/introduction of your post really hits home with your audience. Start with an interesting or surprising story (that relates to the topic) to grab your readers’ attention. Perhaps the topic reminds you of an experience or an example you can share. Or maybe you can include a mini case-study showing your audience how you used this information to help a client. Asking an awesome question or stating an interesting fact is a great way to start an article. How to Write Better Blog Intros & Engage Readers ASAP (With Examples!). It’s great to be educational and share expertise; but, often your audience wants to know HOW to apply the knowledge. How is the info you share going to benefit them? What do they need to DO (not just what they need to know)? Review a relevant product you’ve tried. BONUS points for adding in your affiliate links to these products. Just because you have written content does NOT mean you have to publish it as written content! Why not create an audio or visual component instead (or in addition to) the written one. If the research and information is quality then paraphrase it into a podcast or video, or create an infographic from it. Pull out some quotes or facts and make images to share on social media. Quality health content can and should be repurposed! Don’t forget to use it in your newsletter, as free “opt-in incentives” to grow your email list, on social media, or in your own free or paid programs! If you’ve done the first six items and still have time, this is when you get to do some deeper magic – with the content itself. There are a lot of ways to change up a post so it’s absolutely perfect for your audience and sounds like you. First, ensure everything in the post aligns with your position and branding. If you’re gluten-free, then you don’t want a post with a section on the benefits of grains, right? If there are parts that don’t align, either rework them or delete them altogether. Break long posts into two – especially if they’re nice and long (HINT: If you split them, be sure to list all of the references at the end of both of the shorter posts). Link to other relevant posts on your website. DupeFree Pro helps you rewrite content to avoid duplicates with the search engines. This is a paid program, and I am not an affiliate, nor have I used it. Copyscape which checks the web for duplicate content. Of course, if you’re buying a done-for-you post, you know that some versions of the post will be published on the web, mostly uncustomized stuff. You need to decide HOW different you want your version to be. Here’s an advanced content marketing tip, which is why I left it until the end – create a “content upgrade”. Content upgrades are a GREAT way to use content to grow your email list! It’s basically offering additional valuable content that’s an “upgrade” to the free content you’re offering online for all to see. For example, you can make a downloadable checklist or use some of the practical tips in #5 as a content upgrade. This is an advanced tip for content marketing because in order for your readers to get the more exclusive “upgrade” you’ll ask them to subscribe to your email list so you can send it directly to their inbox. What do you think? Do you use DFY content? How much have you customized it? Will you do so more now? Did I miss something? REMEMBER: I’ve addressed all of these concerns with my “done for you” health articles. Mine are fully customizable, discontinued after 50 sales, edited, purchasable one-at-a-time at any time, and packed with recent research studies as credible references. Have other concerns with done for you health content? I’d love to hear from you! I want mine to be the best ones in the industry! Very interesting! I would love to pick your brain on a non-health related idea. Would like your input. Thanks for the great tips! I know my clients sometimes touch up the content I turn in to them before publishing it. I don’t have a problem with it, since the most important thing is that they are happy with it and that it sound like them, and they still know I’m worth what I charge because I did all the work of coming up with the topic, write it up, organize, it, and optimize it for SEO.